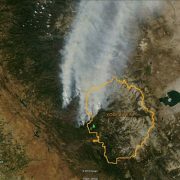 We’ve been following the massive Rim Fire in California that is threatening a major drinking water supply and has already burned across a large chunk of Yosemite National Park. Two magnificent stands of ancient Giant Sequoias, the Merced and Tuolumne Groves, are uncomfortably close to the active fire line, although these trees have undoubtedly withstood many fires in their lifetimes. 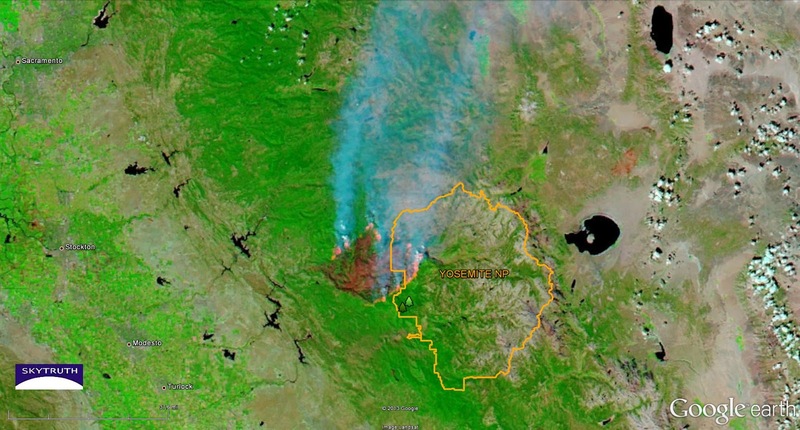 MODIS/Aqua visible satellite image showing plumes of smoke emanating from Rim Fire. Yosemite National Park boundary shown in orange; Merced and Tuolumne groves of Giant Sequoias marked with green tree icons. Image taken at 2:05pm local time on August 26, 2013. MODIS/Aqua 7-2-1 infrared composite version of August 26 image. Burned area is clearly shown in dark orange-brown. Active fire line is bright orange. Detail from image above. 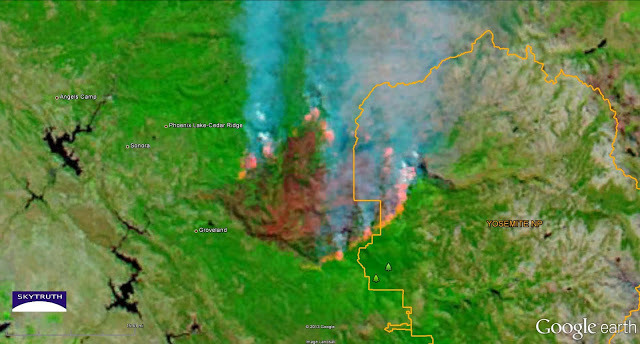 Active fire line is bright orange, including area well within the park boundary. The total area burned at this point is about 170,000 acres (269 square miles). 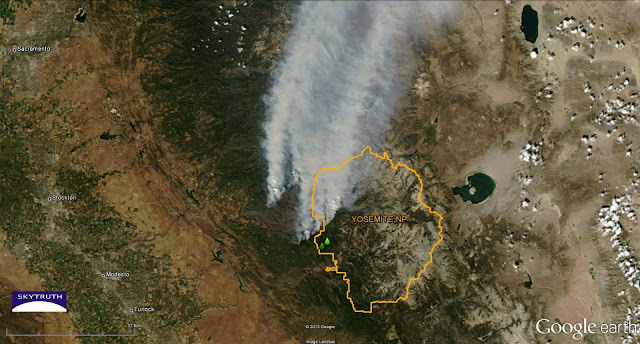 The area burned within Yosemite National Park is about 35,000 acres (55 square miles). For the past year, our satellite monitoring of infrared data from around the world has detected immense amounts of light and heat coming from natural gas flares in North Dakota’s Bakken Shale. A recent study concluded that 30% of the natural gas produced in North Dakota is being wasted by a process called flaring, and the CO2 emissions alone are equivalent to the annual emissions of 1,000,000 automobiles.This does not even touch the unknown air quality impacts from burning fracked gas in large, open flames at ground-level. To study this issue further, we are teaming up with a non-profit called Space For All to send cameras and instruments on a weather-balloon to the edge of space (well, the upper tropopause), to examine air quality and infrared emissions from oil shale fracking and flaring. But what is flaring and why is it an issue? 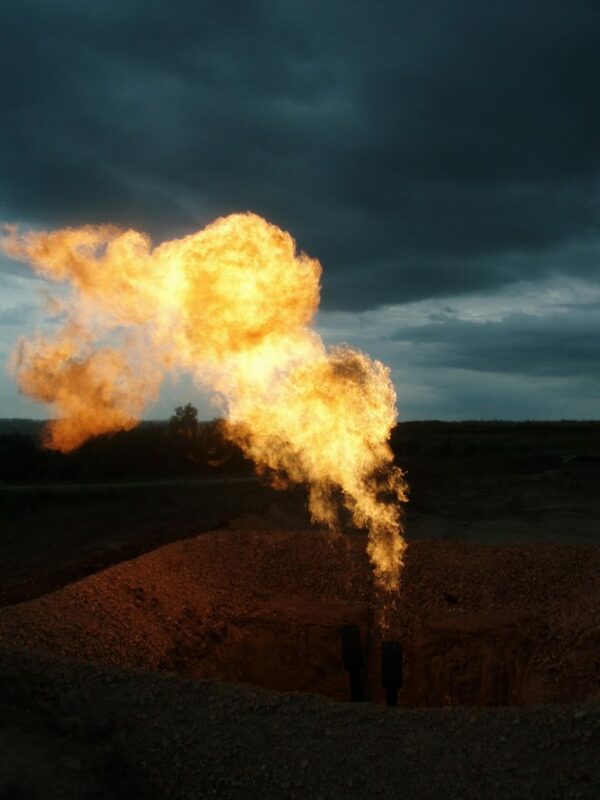 Flaring is the practice of burning off natural gas to dispose of it, primarily this happens right after a well is put into production or when other methods of using the gas are more expensive to implement than its market value. Operators do not want methane (the primary hydrocarbon in natural gas) accumulating on their wellpads where it can explode, and burning it off is slightly less harmful to the climate than venting it directly to the atmosphere. (Above) Annotated image from NASA’s Black Marble composite of nighttime lights as seen by the Suomi NPP satellite. 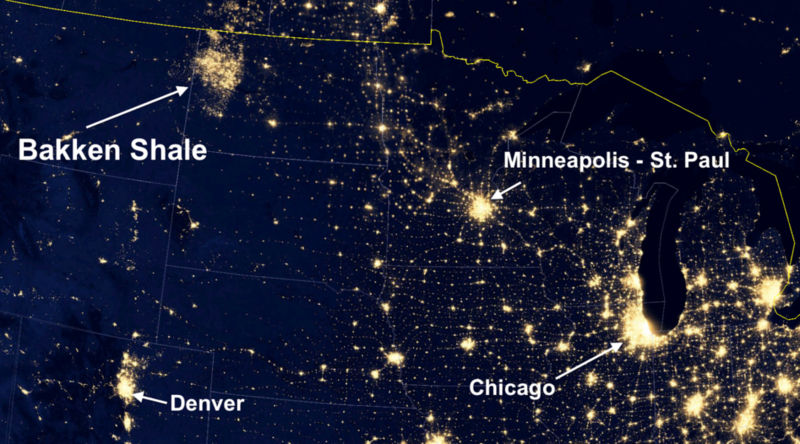 Flaring and rig lights in the Bakken Shale are clearly visible, but we want to better understand the difference between flaring and use this data to better detect wasteful flaring around the globe. With your help, we are planning to go to North Dakota to groundtruth satellite detections of flaring, and launch cameras and air quality instruments to the edge of space, tethered to a high-altitude balloon rig. We will combine our ground observations with detections from the balloon rig, and compare that to satellite data to measure the amount of natural gas flaring there. This will help us test the accuracy of our satellite-based flaring detections so we can do a better job of monitoring environmentally damaging (and unnecessarily wasteful) flaring that happens in the Bakken and around the world. The more good data we can collect, the more we can help groups that are working to reduce and eliminate it. 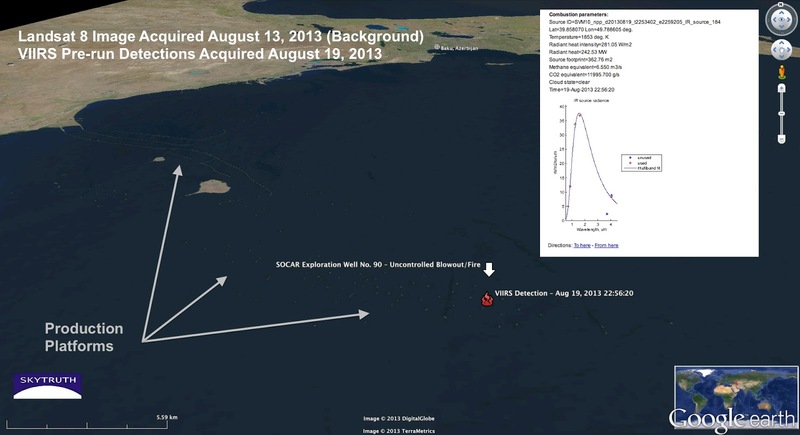 UPDATED – August 26, 2013: Last week we posted about a blowout and fire reported at the SOCAR #90 well in the Caspian Sea. Satellite-based infrared continues to detect heat from the location, and today’s near-infrared MODIS image (below) shows yet another brilliant hot spot where we believe the flaming rig is located. News reports are extremely limited about this incident, but we are continuing to monitor this incident and have not yet detected any oil or chemical slicks on the water. 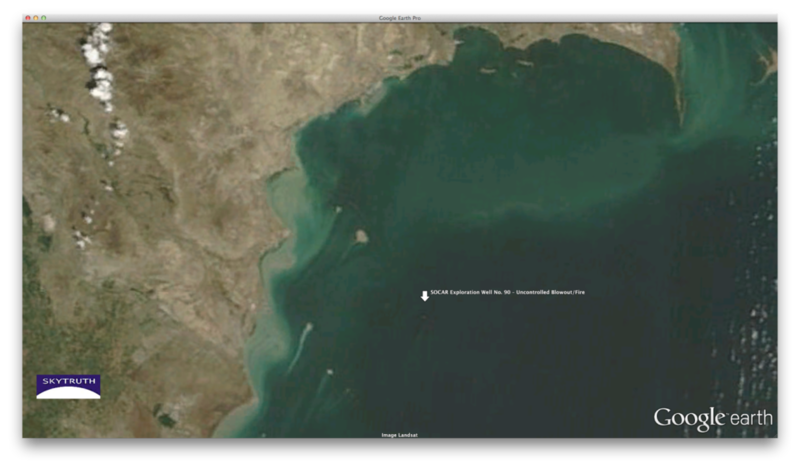 ORIGINAL POSTING – August 20, 2013: Even as discussion heats up for new offshore drilling in the Atlantic Ocean and Arctic Sea, another gas rig is blazing away, this time in the Caspian Sea. On August 17, Exploration Well No. 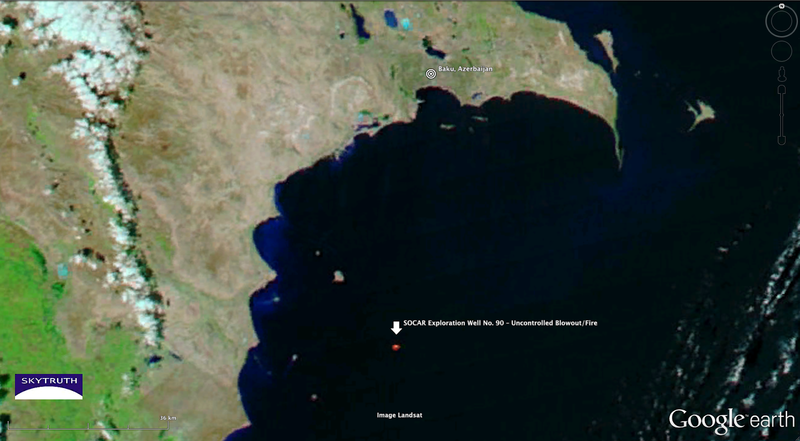 90 in the Bulla Deniz gas field suffered a blowout as it neared a depth of 6,000 meters, and subsequently caught fire. Three days later, on August 20 at 22:37 UTC (6:30 PM Eastern), the Visible Infrared Imager Radiometer Suite (VIIRS) instrument on the Suomi NPP satellite continues to detect large amounts of heat radiating from the site. Clouds obscured the site on the most recent pass of the Terra satellite (MODIS), but we will continue to monitor what we can of the fire and for any evidence of oil or other pollutants on the water. Above: An annotated, cloud-free Landsat 8 image from a week before the blowout shows the area in much higher detail than MODIS images. This oblique view looks north toward the Azerbaijani capital of Baku which is approximately 60 kilometers away. Near the detected heat from the burning rig you can see dense clusters of production platforms in this area of the Caspian Sea, and to the northwest, platforms are so close together they are appear to be connected by a causeway. Raw VIIRS data from NOAA attempts to estimate the intensity of the heat emitted by the fire, but we are not yet confident how much faith we can have in the accuracy of these detections. We are sure they are hot and bright, but teasing out accurate, quantifiable data is complicated. Because this is a gas well and we have not seen any slicks on previous MODIS images, we believe the risk is presently low that a major spill will develop from this incident. Unfortunately, very little new information has been forthcoming except from an Azerbaijani financial news report stating that “SOCAR decides to put out a fire…” The report, which is using a stock photo of the burning Deepwater Horizon rig, explains the commission responding to the incident was hoping to keep the well for production once the fire is extinguished. Other details appear lost in translation. Low resolution images from MODIS reveal very little in the true color composite, but the near-infrared 7-2-1 band very clearly shows the heat of the fire, much like this rig off the coast of Nigeria that we spotted last year. Slide your mouse to the right to see a detail of the true color band of a MODIS image taken August 19 by the Terra satellite. Slide to the left to reveal the near-infrared version of the same image. This burning rig is yet another reminder this summer that offshore drilling is risky business. In early July, a rig at Ship Shoals Block 225 suffered a blowout while plugging a well that had been out of production since 1998. Later in July the Hercules 265 rig was also reworking an older gas well when the operators lost control of the well and had to evacuate. That night the rig ignited and blazed for three days until the well “bridged over” on itself, choking off the flow of gas to the surface. The risk of offshore oil and gas development in aging oil and gas fields, as well as the dangers of deepwater exploration, must be considered in any new proposition to expand offshore oil and gas drilling to waters off Virginia Beach, North Carolina’s Outer Banks, and the unforgiving Arctic. Detail of a MODIS image from the Terra satellite. See the originals here. 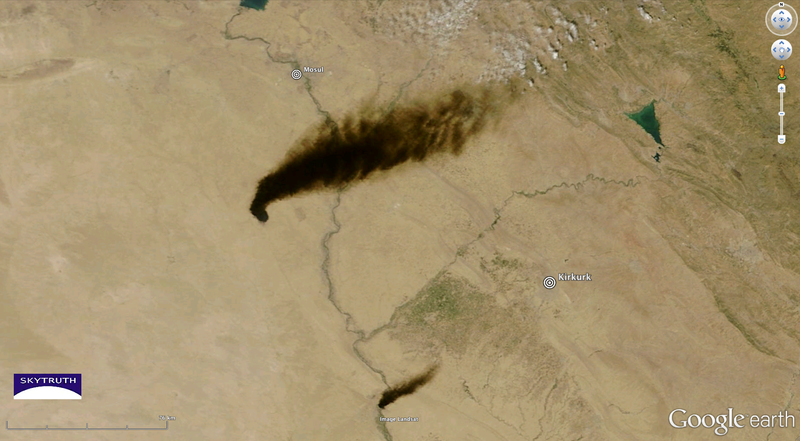 August 23, 2013, Shepherdstown, WV – A plume of black smoke from burning oil can be seen extending for miles across the Iraqi desert from a source believed to be a major pipeline bombing. 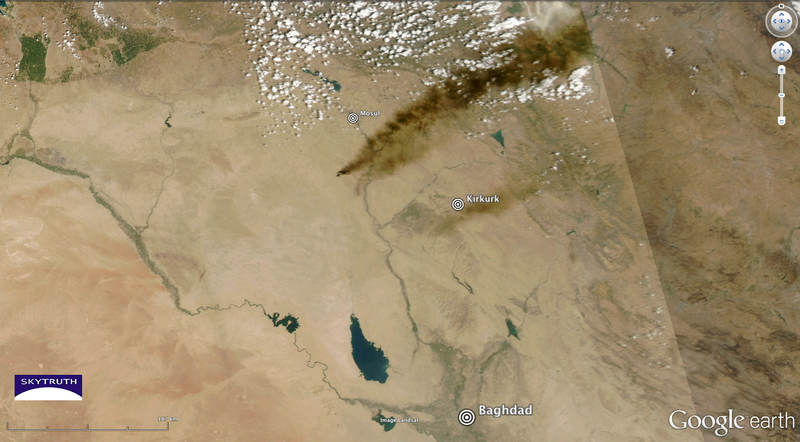 On the morning of August 21, NASA’s Terra Satellite detected an 85 mile-long smoke plume from the main source west of al-Kuwayur, and a smaller 20 mile-long plume near Baiji. The plume was more than 200 miles long, overshadowing Miandoab, Iran, when NASA’s Aqua satellite passed overhead later in the day. A local report indicates that oil has reached the Tigris River and threatens the water supply throughout the Salahaddin Province. Region-wide view later in the afternoon; the plume may actually extend more than 200 miles, but Aqua’s image swath did not catch the entire plume. SkyTruth regularly monitors satellite images and remote sensing data to document issues that impact environmental and public health. In this instance, communities nearby and downstream are subject to water pollution, while people who live downwind are exposed to heavy air pollution, even though they live hundreds of miles from the source. These technologies we use allow us to document what happens when vulnerable fossil fuel infrastructures are damaged, either by an act of war, or by accident. While the BP/Deepwater Horizon disaster was the biggest accidental oil spill in history, the worst oil catastrophe in history was set by Saddam Hussein’s troops retreating from Kuwait at the end of the first Gulf War. In the end, however, the damage done to the environment and the people subjected to the pollution remains the same, whether the cause was accidental or intentional. 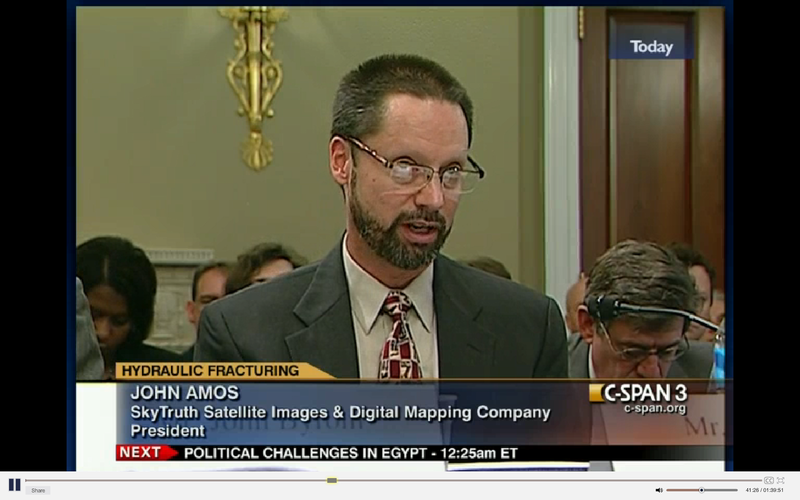 John Amos testifying before Congress in May on a proposed rule to regulate hydraulic fracturing (fracking) on millions of acres of public lands, and on the inadequacy of industry-funded FracFocus to serve as the outlet for data critical to inform academic research, regulation, and the public. DEADLINE: All comments on the Bureau of Land Management’s (BLM) proposed rule – Oil and Gas: Hydraulic Fracturing on Federal and Indian Lands – must be submitted before midnight TONIGHT (11:59 pm EDT – August 23, 2013). 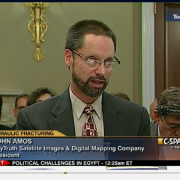 Access to spatial data about environmental issues is fundamental to SkyTruth’s work examining practices like fracking, and we are concerned that regulations proposed by the BLM fall short of the transparency necessary to understand the impacts of fracking that would potentially occur on millions of acres of public land. By designating FracFocus as the disclosure outlet for data about all fracking operations on over 750 million acres of federal and tribal lands, anyone wishing to examine the data and draw meaningful conclusions about the impacts of fracking on water quality and water use, public safety, and any other research purposes, will be restricted by the limitations of this industry-funded platform. Early this year we estimated that the work we did to compile all of the data from FracFocus would have taken a layperson 6 years of full-time effort, almost $90,000 at minimum wage and no benefits, to copy and paste the whole database as it existed in April. We have written before about this disclosure issue, met in person with leadership at the BLM, and testified before Congress about the need to fix this shortcoming. Minimum – Publish the entire collection in a simple standard text format (such as CSV) that can be imported directly into a spreadsheet or database. Better – Provide a way to bulk-download the disclosure data, in machine readable format, through a search query. Best – Automatically re-publish FracFocus disclosure data to Data.gov (a web portal providing public access to Federal government datasets) or a similar Open Data Initiative-compliant publication portal. Enable the bulk download of data in a machine-readable (not PDF) format. Impose no intellectual property restrictions. Designate an official legal reference copy of all chemical disclosure reports. Identify an official publication date for all chemical disclosure reports. Incorporate a document change management system to clearly identify additions or revisions. These recommendations are a bare minimum to understand the full scope of the issue; please consider including them in your own comment to BLM. Our comments are only one part of the big picture, but they are fundamental to addressing other issues such as industry’s use of trade secret exemptions to withhold data. Our interest is to inform the public and decision-makers about the environmental impact of these activities and produce scientifically robust images and resources. We encourage everyone to review our comments and resources on this issue, draw your own conclusions on the issue, and take an active role in the democratic process. To review our full comments and recommendations, click here.